I'm not sure "loving" was on her mind, but she was consumed with whatever she was reading. If you look the backgrounds in many of the shots taken in New York City, you can see garbage piles, beat up buildings, dirty streets and unshoveled snow. Some say those give the city its character? 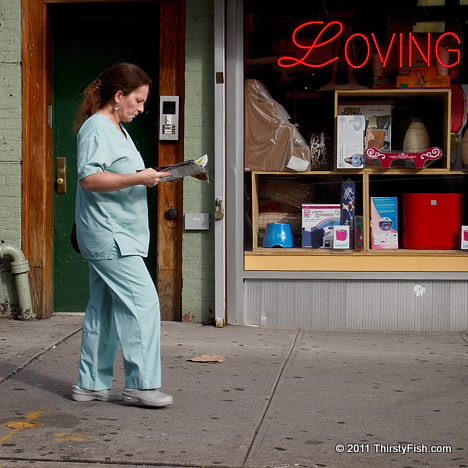 This photo was taken in one the better neighborhoods of Brooklyn, Cobble Hill. New York's infrastructure is crumbling. More generally, the U.S. infrastructure, once the envy of the world, is in dire straits. The infrastructure problem is evident in airports, bridges and roads. Many that travel extensively will testify to that. During the late 17th Century, there was an argument between two great mathematicians, Isaac Newton and Gottfried Leibniz, about who had first invented calculus. The "calculus controversy" became a thing of national pride between the British and Europeans. For a period of over a century, proud British mathematicians refused to interact with their European counterparts and consequently remained stagnant in the realm of mathematical discovery. Today, the consensus is that Leibniz and Newton independently invented calculus. There is a good reason that hubris is considered the original and most serious of the Seven Deadly Sins.